Sonic checks a Chao's stats in the Station Square Chao Garden in SADX. A Chao Garden is a place where Chao can be raised. Chao Gardens were first introduced in Sonic Adventure. Most gardens can contain up to eight Chao at time except for the Tiny Chao Garden which can only contain one. In Sonic Adventure and its remake, there are three separate Chao Gardens for each Adventure Field. Each garden will have a Chao Transporter, as well as two warping platforms that will take you to another garden. In the Dreamcast version, the Chao Transporter is modeled after a VMU, and using it will transport a player's Chao to Chao Adventure; in the GameCube version, it is modeled after a GBA, will transport a Chao to a Tiny Chao Garden to a Game Boy Advance via Link Cable; and in the 2020 re-release it is changed to a generic-looking machine known as the Chao Departure Machine. The player can also use the Transporter to name a Chao, or to say "Good-bye" to a Chao by releasing it into the wild. The first Chao Garden is located in Station Square inside the hotel, and can be entered through the elevator on the left. The garden looks more like a deluxe hotel suite rather than a garden. The floor is made of marble and there are two fountains surrounded by water where the Chao can swim. There are two Chao eggs when the player visits for the first time to get them started. On the far side of the garden, there are two large doors. Behind these doors is the entry way to the Chao Races. In Sonic Adventure DX, the garden has one fountain surrounded by water and there is the addition of the Black Market from Sonic Adventure 2: Battle near the front door. The second Chao Garden is located in the Mystic Ruins near in a cave near Tails' workshop. A trolley must be taken to get there. This garden features ancient ruins in a lake with a waterfall. Like the other garden, there will be two eggs when the player visits for the first time. In Sonic Adventure DX, there were some minor aesthetic changes. The water was made much more shallow, likely to prevent the player from drowning. The third Chao Garden is aboard the Egg Carrier in the main room. To access it, the player must spell "EGGMAN" using the lighted panels on the floor, and by doing so a door will open and the player can use the warp plate inside to get to the garden. Notably, the Egg Carrier garden is the largest of the gardens. It is set on a private island somewhere in the ocean. For some reason, there is a large missile sticking out of the ground. In the center, there is a mountain with some kind of base on top that cannot be entered. In Sonic Adventure DX there were some minor aesthetic changes. The ocean is not as deep and it cannot be ventured in as far as it could be in the Dreamcast version and the mountain has a lower altitude. Shadow in the basic Chao Garden in SA2. Like Sonic Adventure, Sonic Adventure 2 and its remake also has three different Chao Gardens. They can be visited through Chao World after the player obtains a Chao Key from a Chao container in any of the Action Stages. Only one garden is available from the start while the other two need to be unlocked later. The first Chao Garden is a basic garden. It has two fruit-bearing trees and a small pond with a waterfall concealing a cave that leads to the Chao Races. Near the back is the Chao Transporter where the Chao may be transported to Chao Adventure 2. When the player first visits this garden, there will be two Chao eggs ready and waiting to be hatched. In Sonic Adventure 2: Battle there were a few changes to the Chao Garden. The garden now has three trees instead of two, and extra flowers were added in as well. The cave behind the waterfall was dubbed "Chao Cave", and Omochao is inside with detour signs. One direction leads to the Chao Races while the other leads to the new Chao Karate. The Chao Transporter is also modified to look like a GBA. It has basically the same functions as the Transporters from Sonic Adventure: DX (Note: Sonic Adventure 2: Battle was released before Sonic Adventure: DX); The only difference is that this version does not have the naming feature, as that can be done via the Fortune Teller in the Chao Kindergarten. Instead, it is simply a transportation system which allows a Chao to be moved from one Memory Card to another, sent to a GBA, or released into the wild. In the 2012 re-release, saying "goodbye" to Chao is the only available feature for it. After the player raises their first Hero Chao, the Hero Garden will become available. A staircase in the Lobby will appear, taking the player up the the Hero Garden. This garden is much larger than the basic Chao Garden, sporting a serene theme and is set high in the heavens. There is a river complete with a bridge that the player can cross. The river flows from a marble fountain situated in the middle of the garden. On the left is a white altar, a perfect place for Chao to test their flying abilities. There are two fruit-bearing trees. These trees look slightly different from the ones in the basic Chao Garden, and the fruit they produce are much lighter in appearance but are functionally the same. The Chao Transporter is located to the right of the garden, and has been decorated to fit the theme of the garden. When the player first visits, there will only be one Chao egg to start with. In Sonic Adventure 2: Battle, the layout of the garden was changed. The river and the bridge were removed making the fountain area into a closed-in pool that is made more shallow so the player can no longer drown in it. An extra fruit tree was added as well. When the player visits for the first time, there will be two eggs rather than one. Likewise, the VMU port was converted into a GBA port. Unlike the VMU port, the GBA port did not receive a special decoration. 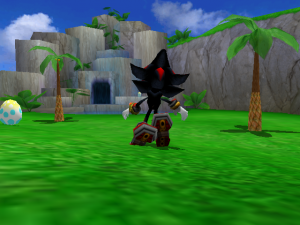 After the player raises their first Dark Chao, the Dark Garden will become available. A staircase in the Lobby will appear, leading the player under the floor and down to the Dark Garden. This garden seems to be the largest of all the gardens. This garden is given a spooky theme and is set deep in a hellish landscape. The ground is white and there are tombstones lining the walls. To make the place even creepier, the water is given a crimson hue, making it appear almost blood-like. To the right is a tiny mountain that can be climbed. At the top is a sort of grave yard. Besides being a mountain, there is a hidden cave inside it that can be entered through the water way. The walls of the cave has strange drawings on it. In the center is a cauldron filled with skulls. The fruit trees in this garden look drastically different the the trees in the other gardens. They appear to be almost dead and they produce a red fruit that looks like a raspberry, but are otherwise identical in function to the fruits in other gardens. The Chao Transporter is placed on the left of the garden, and has been decorated to fit the theme of the garden. Like the Hero Garden, there will only be one Chao egg when the player first visits. In Sonic Adventure 2: Battle, the layout of the garden was changed. The mountain and the secret cave were both removed, and in their place is a dead-looking tree with a cage attached to the branch. An extra fruit tree was added as well. When the player visits for the first time, there will be two eggs rather than one. Likewise, the VMU port was converted into a GBA port. Unlike the VMU port, the GBA port did not receive a special decoration, but interestingly, it still has the same sound effect when a Chao is placed inside. Sonic Advance, Sonic Advance 2 and Sonic Pinball Party all have what is called a Tiny Chao Garden. Unlike their Adventure counterparts, these gardens can only carry one Chao. A Chao can be brought in by either getting a free egg from the market or transporting one from Sonic Adventure: DX or Sonic Adventure 2: Battle. The Tiny Chao Gardens from both Advance games are exactly the same in appearance; the only difference is that one of the mini games is different between the versions. The Chronicles Chao Garden lets you review the Chao's stat effects. The Chao Garden in Sonic Chronicles: The Dark Brotherhood serves as more of an item screen than a walk-in location as in the Adventure games. 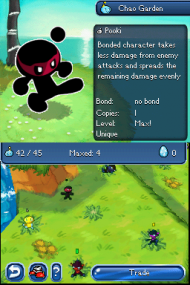 Chao Eggs in Sonic Chronicles are found in the levels, and hatched Chao can be equipped to a character in order to modify their combat statistics in some beneficial way. The Chao Garden simply serves as a menu screen from which appropriate Chao can be selected. This page was last edited on 10 January 2019, at 09:23.